Is improvement a straight line? A question I am often asked is this - "am I on the right path?" I've been there, and I'm sure that you have too. I don't think the path is straight, even the good projects bend and wane a little. I once heard a Chinese proverb 'you can’t polish a gem without friction' and I like to think that some of the conversations (to put mildly) that I experienced were simply that, an essential rub in order to create something better. The first real friction I encountered was when it became common knowledge that I had improvement plans and that I intended to implement these plans. Previously plans had been drawn up for similar things by other people, but never acted upon or followed through... mine just hadn't been written up at that point. Now that I knew how bad the delivery performance was I wanted to understand how we got ourselves into that position. Further to this I was curious why we had never got out of this position during the four years to which the data related. From looking at the split of work going through the business and our near steady order book value overall, it was fairly obvious that some departments were overloaded and others were not. We only re-allocated labour periodically to minimise some departments being slack whilst others were stretched. From asking around I came to the simple conclusion that our order book was loaded on guesswork and it depended upon the turnover figure currently loaded for a particular month, irrespective of whether the product mix was right or labour levels were available. Finding out this information got me into a whole load of unpleasant conversations about minding my own business and being a meddler. Telling people it was my business didn’t help matters, but I wasn’t in the mood for pleasing certain people in the business. One particular day my mind returned to another point in production that was bugging me, the loading of the process vessels. On my whiteboard I drew out the vessels, and did some very basic calculations about the throughput in each department before the processing stage and came up with a simple solution to the capacity overload being experienced in the Assembly Shop. One of my current antagonists entered my office and watched me for a moment at the whiteboard before asking me what I was doing. After explaining my diagram I was told just how far off the mark I was and that this problem had been solved by someone with a degree in the 1970s. I felt it was only right to counter with my take on things but was left talking to myself as the other person left the room mid-sentence. The next day the same person came back to my office and quizzed me about my credentials and my previous work experience. I explained what I wanted to do, and how I wanted us to work together to achieve these goals. I got very little reply to this before they once again left my office. Later that week there was a shock announcement that the business was going to request ten people to take voluntary redundancy. Our financial figures weren't stacking up and we needed to ‘lose some bodies’. After the meeting my boss came to visit me, the other Production Manager left the room. I was informed that a couple of members of staff were going to go, including the person who had criticised my process vessels idea and, one of my direct colleagues, the Production Planner. Due to a lack of resource going forward I was then informed that I would be responsible for the planning and scheduling of the orders going through the factory. - Don’t lose sight of the problems you have in your business, capture them for later if you can’t deal with them right now. - If something doesn't work, keep it in your sights until you fix it, or you work out how to fix it. - Most problems can be solved with simple solutions. If your solution isn’t simple (and really effective) keep working on it. If you feel like you are being knocked off course, stick with it! In my experience there is no perfect plan. However you can choose the correct direction, undertake sensible planning and be effective with your efforts. P.S. 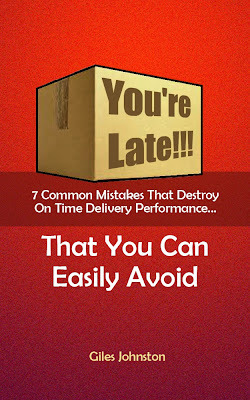 If you want to read more about my story in 'On Time Delivery' click here.